Dow Transports (IYT): Triple Support Test In Play! 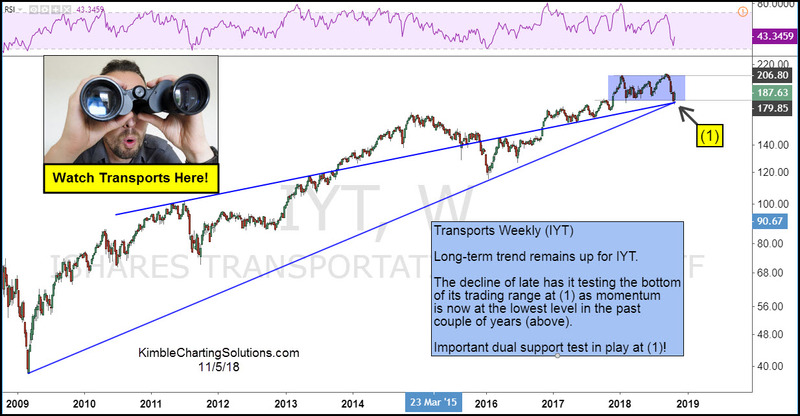 A swift 30 point drop (nearly 15%) from mid-September through the end of October has the Transportation Sector (IYT) testing important long-term support. The Dow Jones Transports Sector (IYT) also represents an important slice of the domestic and global economy. So losing support here would not be good. Let’s look at the weekly chart of IYT. A triple support test is in play for the Dow Transports at (1). The long-term trend remains “up” but the price action could be concerning, due to the drop-off in long-term momentum. A lot is at stake here friends. Keep an eye on how this bonce performs and watch this important support zone!